On the 19th (Fri), take in the spiritual surroundings of Paraportiani Church, then examine the collection at Aegean Maritime Museum, then wander the streets of Little Venice, and finally don't miss a visit to The Windmills (Kato Milli). 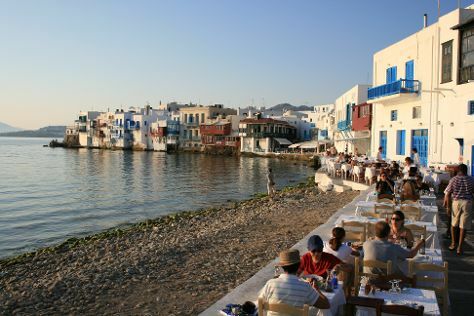 For more things to do, photos, and tourist information, refer to the Mykonos Town route builder website . New York City, USA to Mykonos Town is an approximately 14-hour combination of bus and flight. You can also fly; or do a combination of bus, flight, taxi, and ferry. Due to the time zone difference, you'll lose 7 hours traveling from New York City to Mykonos Town. Traveling from New York City in April, Mykonos Town is somewhat warmer at night with lows of 57°F. Finish your sightseeing early on the 19th (Fri) to allow enough time to travel to Athens. Athens is known for historic sites, museums, nightlife, shopping, and fun & games. Your plan includes some of its best attractions: explore the ancient world of Acropolis of Athens, take a stroll through Monastiraki, take in nature's colorful creations at National Garden, and get engrossed in the history at Acropolis Museum. Quickly create a custom-made itinerary for Athens using our trip planner. Getting from Mykonos Town to Athens by combination of flight and subway takes about 2.5 hours. Other options: ride a ferry; or do a combination of ferry, taxi, and flight. In April in Athens, expect temperatures between 70°F during the day and 55°F at night. Finish your sightseeing early on the 23rd (Tue) to allow enough time to travel back home.